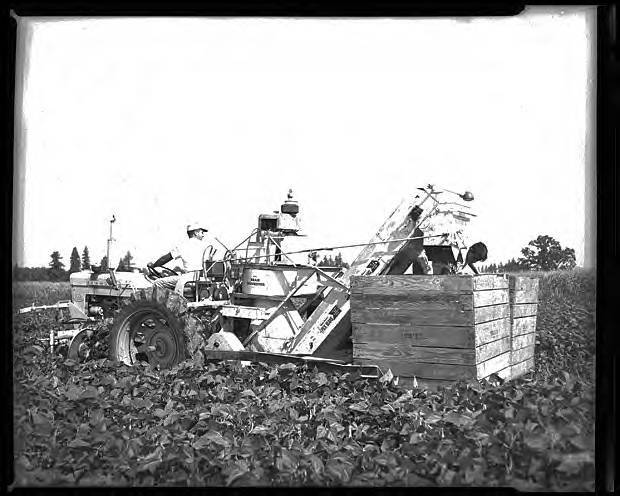 Black and white (overexposed) image of a tractor pulling harvesting equipment through a field of beans. The harvested beans are lifted up a conveyor belt and then dropped into wooden crates behind the picker. A young man rides on the trailer, supervising the fall of the harvested beans. Museum records identify this location as the Carothers & Son farm, near Cornelius, Oregon.